A compilation based on more than 13.4 million documents dated from 1950 to 2016, uncovers a large number of global corporations, government leaders, and prominent people and their use of offshore accounts to avoid taxes or otherwise hide ownership of assets. 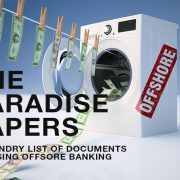 On November 5, 2017 the International Consortium Of Investigative Journalists released what is now dubbed the “Paradise Papers”. The reporting is similar to the Panama Papers, which in 2016 exposed cases involving celebrities and business executives who reportedly moved large chunks of their wealth into offshore tax havens. The source of documents in the Panama Papers came from 11 million documents secured from the Panamanian law firm of Mossack Fonseca. The Paradise Papers is even more extensive as it is based on more than 13.4 million documents dated from 1950 to 2016 from Bermuda including the Appleby Law Firm and the Asiaciti Trust Company. Several members of Trump’s inner circle, including Secretary of State Rex Tillerson and chief economic adviser Gary Cohn, were mentioned in the Paradise Papers. Now while it’s not necessarily illegal to distribute wealth across secret companies, which can be used by the super wealthy as legitimate forms of holding their wealth, shell companies can be used to evade taxes and disguise illegal behavior. Also just because someone is mentioned in the Paradise Papers, it doesn’t necessarily mean their business holdings are illegal or they did anything illegal. Unfortunately, when one is mixed in with a basket of bad apples, you know how people will tend to judge the whole harvest. Nevertheless, this leak is another huge hit the offshore world has taken. The Panama Papers included connections to families and associates of Syrian President Bashar Assad, former Libyan dictator Moammar Gadhafi, and former Egyptian President Hosni Mubarak. The Panama Papers also confirmed that associates of Russian President Vladimir Putin have funneled as much as $2 billion through offshore accounts, banks and shadow companies. Some well-known celebrities were also identified in the Panama Papers that include Jackie Chan, Micheline Roquebrune and Lionel Messi. So as government tax officials start reading the Paradise Papers, you can expect in the coming months that many new names will come out that the IRS will be interested in targeting. Taxpayers with an interest in, or signature or other authority over, foreign financial accounts whose aggregate value exceeded $10,000 at any time during a calendar year must file FBARs. It is due by the due date of your Form 1040 and must be filed electronically through the BSA E-Filing System website. Generally, U.S. citizens, resident aliens and certain non-resident aliens must report specified foreign financial assets on Form 8938 if the aggregate value of those assets exceeds certain thresholds. Reporting thresholds vary based on whether a taxpayer files a joint income tax return or lives abroad. The lowest reporting threshold for Form 8938 is $50,000 but varies by taxpayer. Additionally, the penalties for FBAR noncompliance are stiffer than the civil tax penalties ordinarily imposed for delinquent taxes. For non-willful violations it is $10,000.00 per account per year going back as far as six years. For willful violations the penalties for noncompliance which the government may impose include a fine of not more than $500,000 and imprisonment of not more than five years, for failure to file a report, supply information, and for filing a false or fraudulent report. 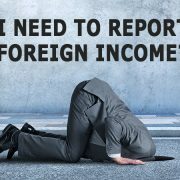 The IRS has special programs for taxpayers to come forward to disclose unreported foreign accounts and unreported foreign income. The main program is called the Offshore Voluntary Disclosure Program (OVDP). OVDP offers taxpayers with undisclosed income from offshore accounts an opportunity to get current with their tax returns and information reporting obligations. The program encourages taxpayers to voluntarily disclose foreign accounts now rather than risk detection by the IRS at a later date and face more severe penalties and possible criminal prosecution. For taxpayers who willfully did not comply with the U.S. tax laws, we recommend going into the 2014 Offshore Voluntary Disclosure Program (OVDP). Under this program, you can get immunity from criminal prosecution and the one-time penalty is 27.5% of the highest aggregate value of your foreign income producing asset holdings. For taxpayers who were non-willful, we recommend going into the Streamlined Procedures of OVDP. Under these procedures the penalty rate is 5% and if you are a foreign person, that penalty can be waived. This is a very popular program and we have had much success qualifying taxpayers and demonstrating to the IRS that their non-compliance was not willful. Don’t delay because if the government finds out about you first, you could be in the same hot water as Rex Tillerson and Gary Cohn. Taxpayers who hire an experienced tax attorney in Offshore Account Voluntary Disclosures should result in avoiding any pitfalls and gaining the maximum benefits conferred by this program. Let the tax attorneys of the Law Offices Of Jeffrey B. Kahn, P.C. located in Orange County, San Francisco and other California locations resolve your IRS tax problems, get you in compliance with your FBAR filing obligations, and minimize the chance of any criminal investigation or imposition of civil penalties. It’s been about 20 years since the U.S. suddenly fell in love with the adorable 5-inch Beanie Baby dolls created by Ty Warner. But in October 2013 billionaire Ty Warner broke down crying in U.S. District Court as he pleaded guilty to one count of tax evasion for hiding $25 million in income in secret Swiss bank accounts. Ty Warner wasn’t afraid to take risks. Beanie Babies first appeared in 1993, triggering a craze for the plush toys fashioned into bears and other animals. He ignored the naysayers after Beanie Babies flopped during their initial debut, and pressed forward with a product he believed in more than anyone else. One reason why the toys easily supplanted other fads such as Ninja Turtles and Cabbage Patch dolls was partly because of Mr. Warner’s strategy of deliberate scarcity. He rolled out each one—Spot the Dog, Squealer the Pig—in a limited quantity and then retired it. At the height of the Beanie Babies craze, Mr. Warner was shipping more than 15,000 orders per day to retailers. This explosion of sales made him rich. Forbes recently put his net worth at $2.6 billion. Mr. Warner’s obsession even became an asset. When he would suddenly change product designs, collectors and wannabe entrepreneurs would snap up the $5.00 plushes and resell them on eBay at mark-ups topping 1,000%! Some people would take extreme measures to secure these rare editions. In 1999, Jeffrey White, a career criminal from West Virginia, shot and killed a co-worker at a lumberyard after an argument over Beanie Babies. Three years into the Beanie Babies craze, Mr. Warner boarded a plane bound for Zurich, where he would make the biggest mistake of his life. In 1996, at UBS, one of Switzerland’s largest banks, he opened a secret account invisible to the IRS. The exact amount he deposited is unknown, but by 2002 it had grown to $93 million. To keep the account’s existence from prying eyes, including those of his own accountants, he signed a “hold mail” form that instructed the bank not to send any mail related to the account to the United States and to destroy any documents in his file when they became five years old. The money Mr. Warner stashed in Switzerland remained there, compounding tax-free, for the next dozen years. And each time Warner got to the part on his Federal individual income tax return that asks if the taxpayer has any foreign accounts, he checked the box that said no. As his net worth skyrocketed over the next few years, thanks to his 100% ownership of Ty Inc., Mr. Warner couldn’t help bragging about his success. In 1998, experts questioned his claim to be the world’s top toy seller. (Unlike public companies, private companies are not obliged to release revenue figures.) Miffed, Mr. Warner took out a full-page ad in The Wall Street Journal stating that his company had $700 million in profits in 1997. If true, that would have made it more profitable than his two top competitors at the time, Hasbro and Mattel, which reported $560 million in combined profits that year. But you know the old saying – “What goes up also goes down”. Prices for Beanie Babies eventually crashed and collections, which some people insured for thousands of dollars, became worthless. Mr. Warner’s hubris eventually got the best of him, too and in October 2013 he pleaded guilty to tax evasion. The 69-year old billionaire who created Beanie Babies broke down crying in court in October 2013 as he pleaded guilty to one count of tax evasion for hiding $25 million in income in secret Swiss bank accounts. Mr. Warner (#209 on Forbes 400 list) is not the first Forbes 400 member to draw tax charges. Leandro Rizutto (#296), founder of Conair, had his own run in with tax crimes. And another is Igor M. Olenicoff (#184), a Southern California real estate developer with a net worth of $2.9 billion. According to the charging document, Mr. Warner opened a secret UBS account in 1996. In late 2002, he moved $93 million to Zürcher Kantonalbank. That account produced over $3 million of income in 2002 alone, which he failed to mention on his Form 1040. He even amended his 2002 return in 2007, but once again omitted the offshore income. Mr. Warner still paid considerable tax on the nearly $50 million of 2002 income he did report. But he shorted the IRS by about $1.2 million. Including the next ten years, he admitted to the Court in his plea that he evaded paying $5 million in taxes due to the IRS. That’s a painful omission, not only drawing the tax evasion charge but huge FBAR penalties too. Prosecuters contended that he was concealing as much as $107 million in undisclosed foreign bank accounts. In Ty Warner’s case the FBAR penalty will exceed $53 million. The numbers are staggering. And that ties into criminal penalties. A tax evasion conviction carries up to 5 years in prison and a $250,000 fine. Tax convictions even draw prosecution costs on top of all the back taxes, interest and penalties. And the penalties can be huge. Civil fraud penalties alone can add another 75%. But when it comes to penalties, FBAR charges and penalties—even civil penalties—are the real gravy train for the government. An annual report of foreign accounts in the law since 1970, FBAR’s target money laundering. 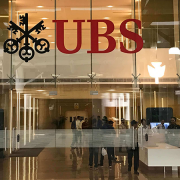 They were not widely known—or widely enforced—until the UBS scandal of 2008 and 2009. But now they are ubiquitous, requiring reporting of foreign accounts even by those with mere signature authority but no beneficial interest. A willful failure to file an annual FBAR can trigger a civil penalty of up to 50% of the amount in the account at the time of the violation. But once Judge Kocoras began to speak, it became clear that Mr. Warner wouldn’t spend one day behind bars for tax evasion. The judge all but produced a sword, asked the toy man to kneel, and tapped him on each shoulder. “Mr. Warner’s private acts of kindness, generosity, and benevolence are overwhelming,” Judge Kocoras said after reading aloud letters from Warner’s supporters. He further lauded Warner for already paying a civil penalty of $53 million (which amounts to just 2% of the billionaire’s estimated net worth), plus back taxes. “I believe . . . with all my heart, society will be best served by allowing him to continue his good works,” the judge concluded. In lieu of the four-year-plus prison term recommended by federal guidelines, Judge Kocoras sentenced Ty Warner to two years of probation, 500 hours of community service, and a $100,000.00 fine. Although Mr. Warner’s numbers are huge, many more garden-variety taxpayers find themselves facing the awkward combination of failing to report interest on foreign bank accounts and failing to file FBARs. Even if the unreported income is small, the combination of amending tax returns to report it plus quietly filing past-due FBARs is a classic “quiet disclosure”. The IRS advises against them and says it can prosecute taxpayers who do it anyway. What the IRS wants taxpayers to do is to join the 2014 Offshore Voluntary Disclosure Program. Like the 2009, 2011 and 2012 programs that preceded it, taxpayers must file up to 8 years of amended returns and up to 8 FBARs. Taxes on the unreported income, interest and a 20% penalty on the taxes seem reasonable. But the sticking point for many is the IRS program’s counterpart to the FBAR penalty. Currently, the program’s penalty is 27.5% of the highest aggregate account balance in the undisclosed offshore accounts. For many, that is a crushing penalty, and for that reason many taxpayers have still refused to come forward taking the gamble that even with the new reporting required by foreign banks under FATCA they can remain undetected. Fortunately, starting with July 1, 2014 the IRS has issued new procedures in its Voluntary Disclosure Program that certain taxpayers could qualify of a 5% FBAR penalty and in some cases all FBAR penalties can be waived. The amount Ty Warner saved in income taxes by stashing money overseas was almost laughably small for a billionaire: just $5 million. He wound up having to fork over 16 times that to the feds. Beanie Babies are still wonderful toys and, if you’re like most people who have them, yours are in mint condition because you once thought they would make you rich. The good news: Those animals will make a wonderful gift for a local hospital or police station, where they will provide comfort to people too young to remember that there was a time when Beanie Babies drove people to madness and its creator to the IRS. Charges like Mr. Warner’s stratospheric bubble-bursting Beanie Baby tax and FBAR consequences are reminders that your freedom is at stake and the dollars in question can get worse—catastrophically worse—than the reduced FBAR penalty offered by IRS in its Voluntary Disclosure Programs. Tax Return Preparers Face IRS Scrutiny and Criminal Prosecution for Assisting in Income Tax Evasion By Not Disclosing Clients’ Foreign Income And Foreign Accounts. The U.S. tax laws require that U.S. taxpayers must report their worldwide income, regardless of whether they are living in the U.S. or abroad. In addition all U.S. taxpayers who have an interest in, or signatory or other authority over a bank, securities or other similar foreign accounts must file FinCEN Form 114, Report of Foreign Bank and Financial Accounts (FBAR), if the aggregate value of the foreign accounts exceeds $10,000 at any time during the calendar year. In addition to filing an FBAR form, the U.S. taxpayer must follow certain reporting requirements on his or her annual tax return. First, the U.S. taxpayer must include a completed Schedule B, Interest and Ordinary Dividends, with his or her annual tax return. On Schedule B, the taxpayer will complete Part III, Foreign Accounts and Trusts, which asks whether, at any time in the year, the taxpayer had a financial interest in or signatory authority over a foreign financial account. Schedule B also asks whether the taxpayer is required to file an FBAR, and if so, in which foreign country the financial account was located. The U.S. Taxpayer may also be required to file Form 8938, Statement of Specific Foreign Financial Assets with his or her annual tax return. Whether a taxpayer is required to file this form depends on where the taxpayer lives, the taxpayer’s filing status, and the value in the accounts. Failure to comply with the above reporting requirements can result in steep penalties to the unwitting taxpayer including civil and criminal charges. When investigating tax evasion, however, the IRS does not limit its inquiries to those who are responsible for paying taxes. U.S. tax law provides that any person who willfully aids or assists in, counsels, or advises the preparation of a tax return or other IRS document that is fraudulent or false as to any material matter can be charged with a crime. If convicted, this is a three year felony that carries a maximum three year prison sentence and a fine of up to $250,000. An individual does not need to sign the document in question to found guilty of this crime and this statute is often is used to catch tax preparers, accountants, or lawyers who help taxpayers cheat on their taxes. IRC §7206(2). In June 2012, three managers (David Kalai, Nadav Kalai, and David Almog) of a tax return preparation service called, United Revenue Service (“URS”), were indicted before the United States District Court for the Central District of California. The indictment alleged that the defendants prepared false individual income tax returns which did not disclose the clients’ foreign financial accounts nor report the income earned from those accounts. If convicted, each defendant faces a maximum of three years in prison for each count and a maximum fine of $250,000 for each count. This indictment appears to be just the beginning of the Justice Department’s attempts in California to prosecute not only those who have undeclared foreign bank accounts and under- (or un-) reported income to the IRS, but those who have assisted the taxpayers with improperly reducing (or avoiding altogether) their income tax liability to the IRS. If you are under investigation or have been charged with a crime related to false preparation or false presentation of tax returns or you have just learned from your client that foreign income and foreign bank accounts needed to be reported on tax returns, you should speak with an experienced criminal tax defense attorney at the Law Offices Of Jeffrey B. Kahn, P.C. who can help you determine the most effective course of action. Description: Protect yourself from loosing your license and being charged with fines and possible jail time. Let the tax attorneys of the Law Offices Of Jeffrey B. Kahn, P.C. located in San Francisco, Los Angeles and elsewhere in California defend you from the IRS. In his closing remarks, IRS Commissioner Doug Shulman affirmed that the IRS has significantly increased its resources and focus on offshore tax evasion. Since 2009 IRS gave taxpayers a chance to come in voluntarily and avoid going to jail. With the IRS’ mining of information it has received over the last few years, the IRS has launched its next wave of investigations on banks, bankers, intermediaries and taxpayers. Not only is the IRS looking to collect additional revenue for past misdeeds but to also to fundamentally change the risk calculus of taxpayers who are thinking about hiding their money overseas and deter the next generation of taxpayers from using hidden bank accounts to cheat on their taxes. The Bank Secrecy Act requires that a Form TD F 90-22.1, Report of Foreign Bank and Financial Accounts (FBAR), be filed if the aggregate balances of such foreign accounts exceed $10,000 at any time during the year. This form is used as part of the IRS’s enforcement initiative against abusive offshore transactions and attempts by U.S. persons to avoid taxes by hiding money offshore. In advance of the expected large wave of enforcement to be commenced by IRS, the IRS had established programs for taxpayers to voluntarily come forward and disclose unreported foreign income and foreign accounts under what the IRS calls the Offshore Voluntary Disclosure Initiative (OVDI). OVDI allows taxpayers to come forward to avoid criminal prosecution and not have to bear the full amount of penalties normally imposed by IRS. Taxpayers who hire an experienced tax attorney in Offshore Account Voluntary Disclosures should result in avoiding any pitfalls and gaining the maximum benefits conferred by this program.